“Hell is – other people!” remains one of Sartre’s most memorable quotes (Sartre, No Exit, 26). It is also one of his most enigmatic – if existentialism posits that people are constantly locked in a brutal struggle against each other, a conflict which we can call the “War of Subjectivities”, how can any society possibly structure itself in a way that fully affirms the value and agency of individuals without falling apart? In order to find a solution, we must first examine Sartre’s No Exit, the play which this line belongs to, and how its setting, grounded in the writings of Heidegger, illustrates what subjectivity is. Because the play itself does not offer an answer, we will then look at other perspectives of existentialism, particularly the ideas of Simone de Beauvoir, to discover how to end the War. Ultimately, we can conclude that the War of Subjectivities only ends by turning away from old dogmas and establishing a new moral system based on a shared commitment to preserve freedom for all. No Exit takes place in Sartre’s conception of Hell, a setting that reflects many existentialist ideas including Dasein, Facticity, freedom, and subjectivity. In the opening act of the play, the Valet’s enigmatic answers to Garcin’s questions about the world outside the room imply that Hell is in a void (Sartre, No Exit, 3). This is confirmed later when Garcin manages to force the door open, only to find a dark, silent expanse beyond the doorway (Sartre, No Exit, 23). The room’s location echoes Heidegger’s description of Dasein, which he defines as “being held out into the nothing” (Heidegger, What Is Metaphysics, 105). “The nothing” which Heidegger discusses and Sartre chooses as his play’s setting is not just “the counterconcept of beings” in the same way that up is the opposite of down and light is the opposite of dark (Heidegger, What Is Metaphysics, 106). Instead, the nothing is more like a force which acts on all beings, including humans; we cannot see or manipulate it, although we can feel its effect upon us. The nothing is at the base of everything, and we confront this when we realize how meaningless our ideals and social mores really are. Most importantly, the nothing “originally belongs to [beings’] essential unfolding” and development, serving as the base of our subjectivity (Heidegger, What Is Metaphysics, 106). What differentiates beings from everything else in the universe is this sense of an internal emptiness, a realization that we, as conscious selves, are not placed into the world with a defined purpose or goal. 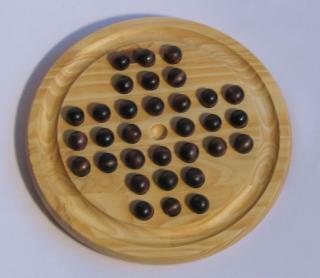 Just as a peg solitaire board cannot change without an empty peg hole, beings cannot grow, change, or “become” without this emptiness of the nothing. Sartre’s characters represent Dasein, and their entire struggle with selfhood and freedom stems from their suspension in the nothing. The setting of No Exit also demonstrates how people are born into a society without their choosing, a condition which Heidegger calls Facticity or “thrownness.” Facticity describes two things: first, our inability to make meaningful change in the world because we are too weak as individuals, and second, the purposelessness of our very existence, as explained above. Sartre creates a rather amusing example of this, by forcing the characters to spend eternity in a room decorated in the style of Second Empire (Sartre, No Exit, 1). None of the characters like the furnishings, but they cannot change these initial circumstances and are forced to acclimate. More importantly, the characters do not choose to be in each other’s company, instead they are thrown into a closed space, forced to injure and be injured by one another. Just as the characters fail to escape the situation they are thrust into, we cannot simply erase the injustices and suffering of our world, and we certainly cannot get rid of the fact that we were born in the first place or that we are surrounded by others. It seems difficult then, if not impossible, to find freedom in Sartre’s Hell. Clearly, Sartre could not be referring to freedom of movement, as the entire play takes place in a small drawing-room. Likewise, Sartre could not be using the word to mean the ability to do as one pleases, or the possibility of choosing one’s circumstances by overcoming Facticity. By “freedom,” Sartre expresses a much deeper kind of liberation – an embracing of one’s individuality and one’s smallness in the face of the nothing’s vastness, and a refusal to blindly follow rules set down by others, such as our parents, politicians, church leaders, and public heroes. This is the kind of freedom, a freedom to be and to examine the nothing, with which Sartre’s characters grapple. Freedom and the nothing constitute subjectivity in Dasein. As subjective beings, humans are capable of contemplating the meaninglessness in the world around them and at the core of their existence; they can also realize the wonderful agency and power they have to “become” in the middle of this void, asserting their being in defiance of the nothing. Unfortunately, subjectivity comes at a cost, and we experience it in two ways. When Peter looks at me, I know of course that he is looking at me. His eyes, things in the world, are fixed on my body, a thing in the world . . . [but] the meaning of this look is not a fact in the world, and this is what makes me uncomfortable. While Sartre can see Peter as an object in the world, and Sartre can also see that Peter sees Sartre as an object in the world, the meaning behind Peter’s gaze is not an object in the world. That meaning comes from Peter’s subjective consciousness. As much as Sartre tries to understand the gaze’s meaning, he cannot directly perceive something based in subjectivity; Sartre can only construct a meaning behind the gaze based on observations of objective facts, like the squint of Peter’s eyes, or the slight grin at the corner of Peter’s mouth. Thus, in order to form any understanding of, or relationship with, someone else, one is forced to deny the other person’s subjectivity. Worse, we are also forced to view ourselves as objects once someone objectifies us. Sartre compares the irritation one feels from being objectified to looking at “a bad portrait of [oneself] which gives to [one’s] expression an ugliness or baseness which [one does] not have” (Sartre, Being and Nothingness, 222). Because the other’s perspective is fully justified, however, we cannot lash out in anger and force the other to stop objectifying us, and instead we suffer a sense of injury and shame. Thus, the “other is essential to [one’s] existence, as well as to the knowledge [one] has of [oneself]” (Sartre, Existentialism is a Humanism, 41). We are forced to rely on others to give ourselves definition in the world – if no one can contemplate a person as an object, that person essentially does not exist. Second, freedom requires people to act authentically; they must actualize the principles, or morals, they arrive at after contemplation. Because of the nothing, no inherent moral values exist in the universe, and so we “cannot decide a priori what ought to be done” (Sartre, Existentialism is a Humanism, 46). Instead, we constantly generate our own morality based on the actions we take. Sartre likens this creative process to a work of art; just as “we cannot judge a painting until it is finished,” we cannot determine a person’s morals before that person has acted upon them (Sartre, Existentialism is a Humanism, 46). Unfortunately, because of people’s subjective natures, each person can decide on a different set of principles, which may sometimes directly clash with each other. In order to realize their principles, people must suppress conflicting principles and thereby prevent others from acting authentically. We confront a devastating paradox: for one to be free, others cannot be free. It is, as Sartre laments, a “revelation of the other as a freedom that confronts my own and that cannot think or will without doing so for or against me” (Existentialism is a Humanism, 41). Thus, we are all engaged in a battle for our freedom, a War of Subjectivities. While No Exit and its characters provide no escape from the War, Simone de Beauvoir sheds a new light on the conflict. De Beauvoir embraces two things which make Sartre’s play a hell for his characters. First, she accepts that “no existence can be validly fulfilled if it is limited to itself” without feeling horrified by it like Sartre (de Beauvoir, 67). Second, she accepts that there “is no way for [people] to escape from this world,” and resolves that we “must realize [ourselves] morally” (de Beauvoir, 69). Instead of treating the world as an inescapable torture chamber, de Beauvoir finds hope in being without limiting others’ freedom. From these two insights, she reasons that there is a way to end the fighting between individuals. De Beauvoir accomplishes this through a single idea – she defines freedom not as a phenomenon of existence, but as a universal truth. Because the “me-others relationship is as indissoluble as the subject-object relationship”, freedom must apply equally to everyone (de Beauvoir, 72). Thus “to will oneself free is also to will others free”, and conversely, to take away someone’s freedom is to debase very idea of freedom for everyone, including oneself (de Beauvoir, 73). In other words, we ascend from Dasein, being in the nothing, to Mitsein, being with others. While Heidegger was the first to define Mitsein, he only saw it in terms of a “being-there-too with [others]” which “is of the character of Da-sein” (Heidegger, Being and Time, 111). To him, Mitsein is simply multiple individuals sharing the experience of being thrust out into the nothing. The characters in No Exit, for instance, would be an example of Heidegger’s Mitsein. Sartre only considers Mitsein insofar as “the lie [of inauthenticity] is also a normal phenomenon of . . . the ‘Mit-sein’” (Sartre, Being and Nothingness, 373), since self-deceit stems from the shame brought on by objectification by another individual. De Beauvoir redefines Mitsein as the basis for freedom and existence; there is no being in isolation but being with others, and there is no freedom in isolation but freedom-for-all. By shifting away from Sartre’s despairing view of subjectivity, de Beauvoir develops a new morality based solely on the universality of freedom, providing concrete guidelines for human behavior and an elegant resolution to the War of Subjectivities. No Exit throws readers into a dark, sinister labyrinth of despair, illustrating how Dasein, Facticity, subjectivity, and thus freedom, reveal a ceaseless War between all individuals. It is as if Sartre succumbs to the very nothingness he, Heidegger, and other existentialists try to fight against. As Hannah Arendt points out in her essay on French Existentialism, the War and other “nihilistic elements . . . are not the consequences of new insights but of some very old ideas” (Arendt, 120). Simone de Beauvoir, however, resolves the conflict by establishing the principle of freedom-for-all as the single, moral foundation of all human behavior. In doing so, she reconciles our individuality with our need to exist with others, and demonstrates how a society can value one without devaluing the other. Arendt, Hannah. “French Existentialism.” Reflections on Literature and Culture. Stanford, California: Stanford UP, 2007. 115-121. Print. De Beauvoir, Simone. “Personal Freedom and Others.” Ethics of Ambiguity. New York, New York: Citadel, 1976. 35-73. Print to Digital. Heidegger, Martin, and Joan Stambaugh. Being and Time: A Translation of Sein Und Zeit. Albany, NY: State U of New York, 1996. Print. Heidegger, Martin. What Is Metaphysics. Stanford, California: Stanford U, 2014. Print to Digital. Sartre, Jean, and John Kulka. Existentialism Is a Humanism = (L’Existentialisme Est Un Humanisme) ; Including, a Commentary on The Stranger (Explication De L’Étranger). New Haven: Yale UP, 2007. Print. Sartre, John Paul. No Exit. Nashville, Tennessee: Vanderbilt U, 2011. Print to Digital. Sartre, John Paul. Being and Nothingness. Dominican House of Studies, 2013. Print to Digital.